U.S. Senator Maggie Hassan at a live taping of The Exchange in January 2018. U.S. Sen. Maggie Hassan joins The Exchange on Monday to discuss national security, health care, and education. We also get her take on the Democratic candidates in the 2020 presidential race and on proposals such as the Green New Deal and Medicare-for-all. Hassan serves on the Homeland Security and Governmental Affairs Committee; the Health, Education, Labor, and Pensions Committee; the Finance Committee; and the Joint Economic Committee. Listen to our conversation with U.S. Senator Maggie Hassan. "N.H. Senators Want PFAS Chemicals Listed As Official Superfund Contaminant," from NHPR. "Senator Hassan Among Lawmakers Who Questioned Top Drug Companies On Pricing," from NHPR. 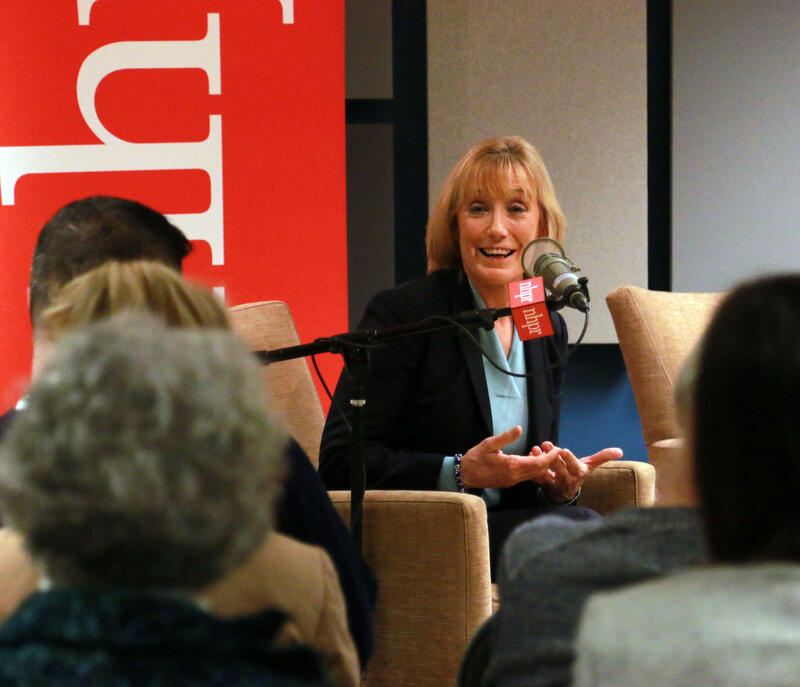 "Sen. Hassan Calls For 'Bite-Sized' Climate Solutions As Green New Deal Makes Waves," from NHPR. "Hassan introduces PROTECT Students Act," from the Nashua Telegraph. "Sen. Hassan grills pharma executive over marketing of powerful opioids," from the Union Leader. Read an edited transcript of our interview with U.S. Senator Maggie Hassan. This transcript is computer-generated and may contain errors. Laura Knoy: [00:01:00] New Hampshire U.S. Senator Maggie Hassan recently called on the Food and Drug Administration to "learn from its mistakes with the opioid epidemic." In a letter to the FDA Commissioner, Hassan formally requested answers to the agency's past policies on approval of opioid drugs labeling and rules around marketing. The demand was just part of a busy week for the senator which also included U.S. Border Patrol announcing it had reached a breaking point at the Mexican border and a political back and forth over border war funding and a possible link to the Portsmouth Naval Shipyard budget. Today on The Exchange. New Hampshire U.S. Maggie Hassan is here. Welcome back. Nice to see you. Senator Maggie Hassan: [00:01:56] Nice to be here. Thanks for having me. Knoy: [00:01:57] Let's start with that letter to the FDA commissioner Scott Gottlieb: it references a recent 60 Minutes report called did the FDA ignite the opioid epidemic. Is that your concern Senator Hassan, that the FDA may have, in the words of this report, ignited the opioid epidemic? Senator Hassan: [00:02:13] So everywhere I go in New Hampshire people talk to me about the ongoing impact that this opioid epidemic is having on individuals on families on our state. First responders who I just met with a couple of weeks ago are expressing what they characterize as compassion fatigue. They are going back to the same locations repeatedly to revive people who have overdosed for example. And frankly the most striking thing that I have heard in those discussions is that they are concerned that children are becoming almost inured to their parent's drug use and to overdosing and the presence of first responders in their home. One EMT told me that she went into a home an 11 year old little girl was giving CPR to her mother. And it's the second time that that little girl has revived her mother. And so I say that by way of background because the ripple effect of this epidemic is extraordinary. It's something that the Granite State is living with. People across the country are living with. And even as we begin to contain you know I hope the number of deaths that we're seeing from this epidemic the long term effects especially trauma on children especially on grandparents now raising their grandchildren is going to be with us for a long time. So it's absolutely critical that we understand not only how to treat substance use disorder and get more resources to the frontline, something I've been working on with Senator Shaheen, other members of the delegation. I'm glad we got significantly more resources to help set up more structured response in New Hampshire. But we have to understand how we got here and we have to understand as well whether our own Food and Drug Administration, the agency charged with making sure that our prescription drugs are safe, whether they wittingly or unwittingly had a hand in overemphasising or encouraging and supporting the overprescribing of these opioids. Knoy: [00:04:39] What specifics are you looking for? Senator Hassan: [00:04:40] So what we're looking for... There is a process for approving a drug that includes a label that describes how physicians should use that drug and whether there are side effects that they should be worried about. And along the way it appears that the FDA made an assumption, incentivized in some way or persuaded let's say by drug companies, that because of the way oxycodone in particular was structured to be long release, that it would be less addictive. And it is not clear that that was ever tested, that there was any evidence to really support that. And I'm very concerned that because of maybe taking a shortcut here, being pressured by pharmaceutical companies to get this product to market, that the FDA may have skipped some critical steps along the way. And that really could have helped fuel the crisis because we know part of this crisis really was started when doctors were encouraged to prescribe opioids on the ground, these super opioids, on the grounds that they weren't going to be addictive. Knoy: [00:05:56] What's the larger goal, Senator Hassan, of asking these questions of the FDA commissioner? Of sending the letter, is it stronger oversight of the FDA? Is it legal culpability for the agency? Is it making a moral statement? Is it putting more of a spotlight on the companies themselves and their motivations? Senator Hassan: [00:06:13] First of all, any time you see a crisis like this one, an epidemic like this one, you have to make sure that you are getting to the root of it so you hope it never happens again. So that's part of it. The other piece of it is that I want the FDA to be accountable to the American people. We need to understand if in fact it made mistakes, we need anybody working for the federal government or any entity for that matter who had a hand in causing a problem to be held accountable for it. That's really important. I want everybody who works in the public health area in particular to know that they're accountable for their actions. But let's also realize that we know that Big Pharma, particularly Purdue and Johnson & Johnson, really worked to pressure doctors, to prescribe these opioids and it looks like they really worked hard to make sure that the FDA would do things their way and to the degree that we want to hold these pharmaceutical companies culpable and responsible and get resources from them to help us fight this epidemic. What happened at the FDA may be very critical. Knoy: [00:07:37] A listener Cody sent us a question about this he asks "What have you done to end the opioid crisis?" And Cody thank you for the question. And Senator Hassan you mentioned earlier the grant that you and the delegation and the governor brought to the table: 45 million dollars, over two years. What are your impressions Senator Hassan, about how these monies are now being disbursed here in New Hampshire? This Hub and Spoke system now called "The Doorway". Senator Hassan: [00:08:00] And it actually now turns out to be more than 46 million dollars over two years so before we did this bipartisan spending agreement last spring that upped the amount of resources for opioids, New Hampshire was getting about 3 million a year. Then it was announced we'd get 46 million and we actually, in a bipartisan spending agreement in September, added even more money to that. So now New Hampshire will get another 11 or 12 million dollars. So that's good news. And that will fund this Hub and Spokes idea. And that's something I heard a lot about from first responders over the last couple of weeks. They, especially in places like Manchester and Nashua, they're hoping that there will be more resources in some of the other parts of the state so that people can get treatment close to home. And that we're we're spreading out the work here a little bit but we should understand that as important as these steps are, the biggest mistake we could make is to think that we're somehow near done. We need to focus on not only having a hub and spoke system but also having the workforce that can support that system so that people can get treatment. Senator Hassan: [00:09:18] And so one of the things we've done is jobs to add to what Cody was asking about, Is in addition to dollars, we've taken steps to make it easier for providers to get the kind of permission they need to do medication assisted treatment. Medication assisted treatment is the gold standard. We also have put into this a Comprehensive Support Act provisions that would allow us to expand integrated prevention treatment and recovery centers. We've also taken steps to allow there to be more patients in a drug treatment facility funded by Medicaid. Again so we can get at the need and the demand here for treatment but we've got a long way to go. And we know that. Knoy: [00:10:04] One more question on this and then I did want to turn to climate change with you Senator Hassan because I've received a lot of e-mails from folks about climate bills, climate policy and so forth. But one more question about this, as we talk about the Hub and Spoke system and the money that has come in now to fund this, looking at the numbers it seems that a fair number of people coming in to these treatment centers are seeking help not just with opioid abuse but other types of addiction, especially alcohol, meth. We asked HHS commissioner Jeffrey Meyers last week about this and he said the grant targets opioid addiction. But he said no one's being turned away. We can use Medicaid money to help treat people who come in with other types of addiction. Still how does that strike you Senator Hassan? We have this large federal grant. A lot of money. Everybody says that's good. But opioids only, when we know addiction wrecks lives no matter what substance we're talking. Senator Hassan: [00:10:55] And first of all I thank Commissioner Meyers for the work he and his team have been doing. And yes, Medicaid dollars, starting with the Medicaid expansion system we put in place, can provide support and coverage for treatment of any type of substance misuse. But we are hearing that we're seeing a growing meth problem. Senators from other states, in different parts of the country, actually are saying that meth is a bigger issue for them for instance than opioids. So it's one of the things I'm going to be taking back to D.C. with me to talk with our HHS folks there and just see whether there are tweaks or adjustments we should make. But to Commissioner Meyers point right now: nobody's being turned away and we will continue to fight to find resources that will address all kinds of substance abuse. Senator Hassan: [00:12:04] Right. I wouldn't want to have happen... Look, opioids are unbelievably deadly and they are our frontline concern right now. They're taking almost 500 people lives a year in New Hampshire and. Knoy: [00:12:17] It's just stunning. One person a day. Senator Hassan: [00:12:20] Yeah, and so I don't want to restrain our resources in terms of going after opioids. But I also understand that sometimes people are presenting with complex needs and we need to make sure we have resources to help people with this illness, regardless of what the substance they're using is. Knoy: [00:13:06] In terms of climate, Senator Hassan, you said you want "bite-sized" climate solutions. So what's an example of a 'bite-sized'? Senator Hassan: [00:13:12] Well, look let's be really clear: we need to address climate change. It is an existential threat and we need to do it urgently. We also need to do it across party lines. We need to get moving on it now. And so you know I haven't and don't support the Green New Deal because it involves a lot of provisions that I think will be a distraction and cause more arguments while we have this pressing need in front of us that we need to be addressing right now. So we need to expand things like the Regional Greenhouse Gas Initiative, something that I worked on in the state Senate and as governor. We need to provide incentives for investments in clean energy, to be sure we need to work on energy efficiency within our buildings. One of the most basic things we could do is work to make sure that the federal government's buildings are much more energy efficient and use green energy, something that would have a real and significant impact. There is item after item here that we know we can do. We could work on net metering. I put in a bill that would make sure that states understood best practices in net metering, so more and more people could be incentivized to use green energy in their homes and sell back their access to the grid. We could all benefit from that. Those are the kinds of things we can do right now, that get us started, that have a real impact. And as we incentivize clean energy jobs and clean energy solutions, I think we will see a growing and better and better impact. And if there are more comprehensive things people want to talk about, we can talk about those too. But I don't want the debate over things that aren't directly related to climate change to derail our efforts. And since we know there are things that can work, we've seen them more in a variety of places, we should get going on those right now. Senator Hassan: [00:16:12] Especially, the methane emissions from the fracking process have a real impact here. So I think the question is really well placed one: when natural gas and when fracking was first developed and produced more cheaper natural gas, I think people did think 'gee, this is better than coal. This is better than oil. And so it's a good bridge fuel.' I think the evidence now says that it's not as good as we thought. As always what we have to do is balance the need for cleaner and cleaner energy with the quality of life demands that Americans make. But I think again if we direct dollars to investing in more wind more solar and other clean energy solutions and the storage capacity for those kinds of energy we will see less and less reliance on natural gas. And I think the points are very well taken. Knoy: [00:17:12] Well and I've got a couple of e-mails. I won't read all of them but several on a specific bill in the House of Representatives. I'll read Rachel's e-mail. She says 'I'm aware that a bill called the Energy Innovation and Carbon Dividend act which would place a revenue neutral-fee on carbon dioxide causing pollutants is currently on the floor the U.S. House. I'm wondering if Senator Hassan would be willing to support it if it comes before the Senate for a vote?" So revenue neutral carbon fee, what some people call a carbon tax, Senator Hassan? Senator Hassan: [00:17:40] I will look at the bill, I haven't looked at that one closely. Again, I think it's really important to invest in steps that move us as quickly as we need to go. And Iwant to make sure that any proposal doesn't distract and take us away from that but I will look very closely at that. Knoy: [00:18:01] Given that the U.S. Senate is Republican controlled, what solutions might there be in the Senate, Senator Hassan, that could move the needle on emissions, on clean energy, some of the priorities that you talked about? What's the bipartisan solution, if any? Maybe it's too partisan. I don't know. Senator Hassan: [00:18:17] So one of the great disappointments I have with the current Senate Republican majority is their refusal to bring onto the floor of the Senate proposals that would address climate change. We have seen in recent weeks a few of my colleagues on the Republican side of the aisle actually acknowledging on the Senate floor that climate change is real and that human behavior is a major cause of it. That's a giant step forward because we have had silence on the floor about this other than Republicans taking to the floor to defend the fossil fuel industry. One of the things we have been pushing our Republican colleagues to look at is that the insurance industry is now predicting that climate change is going to have a real negative impact on property values especially coastal property values because of sea level rise. And so you know what we've been trying to say to them is look if huge global insurance companies say climate change is real and huge global insurance companies say that humans have had a significant role to play in it. Where you guys now believe that it's real and take some action. So the question I now have is will the Republicans actually do something now that some of them are acknowledging it's real. Knoy: [00:20:32] Senator Hassan, we talked about the opioid crisis, we've talked about climate change. Let's move on to immigration. This has been huge, huge news recently. And just on Friday, President Trump complained to reporters about what he called Mexico's failure to stem the migrant influx. We've all heard about these rising numbers and that in a tweet the next day, he said if they, meaning, Mexico don't stop them, we're closing the border, we'll close it we'll keep it close for a long time. Not playing games. The president said when you sit on the Homeland Security Committee should the border be closed temporarily to get this problem under control. Senator Hassan: [00:21:08] The quick answer is we do a massive amount of trade with Mexico and others over the Mexican border every single day. So the impact to our economy would be significant. And it's not a productive suggestion from the president. And I wish that he would do some listening to the people on the lines. I was at the border last spring visiting with our CBP agents and others and then I went from the border spent a couple of days on the border and then actually went down to Mexico City to talk to Mexican officials. Here's what I heard from our CBP frontline personnel. We need more personnel, we need more infrastructure, like roads they need more in a variety of vehicles like TVs and in some cases horses to patrol certain kinds of terrain. Yes, in certain places they need strategically placed fencing and you've seen both Democrats and Republicans agree that we should invest in more strategically placed fencing and repair some of the fencing that we have. But what is critical here is that as we have this discussion we realize that threatening our neighbor to the south with whom we do a great deal of trade and who has been an ally of ours isn't going to build the kind of relationship that will help us get at the underlying conditions that are causing these migrant flows. So also this weekend the president said that he wanted to stop all aid to countries in the Northern Triangle: Guatemala, El Salvador, Honduras, As if punishing those countries would somehow convince people who are desperate enough to make this incredibly difficult journey up to the Mexican border change their minds that disregards the root causes of these migrant flows. We know that that foreign aid is helping local governments begin to address things like gang violence which is one of the reasons you see people take this incredibly risky journey up to the border. So we need to be having constructive conversations with our neighbors to the South about how we can help stem the migrant flows. But we shouldn't be politicizing this and we shouldn't be threatening these neighbors. And we need to have a policy at the border that's also consistent with our values which also means that the administration's decision to separate children from families is unacceptable and unconscionable and we have to continue to stand up to that. And I wish we were marshaling all our resources right now at this increased migrant flow we see and finding constructive ways to deal with it at the border rather than having this kind of policy by tweet that just ratchets up the debate and the argument without getting to a bipartisan solution to the issue. Senator Hassan: [00:24:38] So one of the things our diplomatic corps does is work with governments, to reform to help police learn how to be the kind of non corrupt police force that Americans take for granted in our own society. We know how important the work that our diplomats are doing it's gang violence, it's also poverty in these places. So it would be nice if we could deliver resources and change things overnight but that isn't the way this works historically. The foreign aid that the president is talking about cutting off as I understand it has really only been going to these countries for a couple of years so too early to do it. But look when I went to Mexico City, I met with folks from our State Department about the work they are doing among other things. They're helping the Mexican law enforcement officials learn how to build cases against drug cartels that would survive in an American court so that if people were extradited to the United States our cases against these cartel leaders would be successful. That's the kind of work our diplomats can do that will have a long term impact. But in the meantime there are important and strategic things we need to do at the border to alleviate. Knoy: [00:26:12] Yes, let's talk about that. So short term? What do you want to see? Senator Hassan: [00:26:15] But the president, the president's threats on Twitter, make that hard for us to do. And this focus on one big wall and a continuing fight with Congress and threats to take money that we've appropriated for other things to build a wall rather than invest in the kind of short term solutions increase the facilities increase of personnel down at the border is really frustrating. Knoy: [00:26:42] Let's take some calls, Senator Hassan, Paul's calling from Pembroke. Go ahead Paul you're on the air with Senator Hassan, welcome. Caller: Paul: [00:26:57] Hi thank you very much. Good morning Senator Hassan. I have a question as far as the statement that you made I was just curious as to maybe you could expand on it. Why would it be the United States issue to come to the finding of why immigrants are crossing the border and coming into America? Wouldn't that be the country they're coming from's issue of why they want to come to America? The reason why I come here is because America is great. But I don't think that, I don't think we should be focusing on why they want to come here. Senator Hassan: [00:27:33] Thank you Paul for the call and for the question. So we have increasing number of migrants right now on our border who are seeking asylum something that our country's law says they have a right to do. Because we have always considered ourselves to be a country that welcomes newcomers who want to come here and build a better life because as you said America's great it's the greatest country in the world and people want to come here. What we also though want to do is have an orderly process when people come to the border seeking asylum so that we aren't straining our resources so that we can make sure that we're keeping our borders secure so that we can devote resources at the ports of entry, not only to making sure that trade flows easily but so that we detect and catch smugglers when they're trying to smuggle drugs over the border for instance. We need to be able to have an orderly and safe border. And for us to do that it would be good if we could stem the tide of migrants to our border and to do that understanding why they're coming is really important and what we know is that in the Northern Triangle for instance we are seeing increasing levels of poverty and chaos and gang violence to the point where migrants feel they have no other choice but to make what is by all accounts an incredibly arduous journey to our border. So we should be working to you know to try to change some of the conditions with the home countries. I mean it's their responsibility to improve their country but it's in our self-interest frankly to help them do that. And so when we have a self-interest it seems to me that one of the ways we can make this better is you know work with those home countries to try to improve conditions. So we don't see this kind of sudden flow on our border that creates its own set of issues and its own set of risks for us. Knoy: [00:29:47] Paul thank you very much for the question. And I have just two more questions on immigration for you Senator Hassan and then I do want to move on to water contamination here in New Hampshire, as you know that's been a big, big issue and also some of the education bills that you've been working on. But talking about the border, you did vote with the Senate to overturn the president's national emergency declaration to use Pentagon funds to build a border wall. Why did you oppose that effort Senator Hassan? Senator Hassan: [00:30:13] Well, first of all as the president himself has said this isn't really an emergency in the sense that the National Emergency Act was established. And secondly we have a process under the Constitution that says Congress appropriates money and makes decisions about how to spend money. We, in a bipartisan way at the end of the last year, voted for government funding bill that included significant resources for border security including some fencing in some places. We understood from the White House that they agreed that this was a reasonable approach. And then at the 11th hour the president decided to veto it. And as we all know shut down the government over it for about 35 days which was unacceptable and wrong. I believe strongly that we need to strengthen our border security. We need to do it in a way that is strategic and smart and we need to listen to our frontline personnel. And I also think that the president the United States is violating the Constitution when he takes money that we have already voted to appropriate in bills that he signed. He agreed with us for instance that the funding for the Portsmouth Naval Shipyard for these new projects that will help us do our job at Portsmouth even better. Remember we maintain repair and modernize the entire attack class of submarines the United States and the Portsmouth Navy shipyard. We need critical improvements in modernizations at the shipyard to do that better and help secure our country. And he signed a law that appropriated money for that purpose. And now he's talking about going back and taking that money away for a war that for a wall that experts tell us isn't the best way to secure our border. Knoy: [00:32:11] So there's the macro issue which a lot of Democrats have said. But for you in particular and Senator Shaheen, there's the micro issue of some of the funds that could be yanked from Pentagon spending bills already approved as you said might come from the Portsmouth Naval shipyards budget. That's been a big concern. Senator Hassan: [00:32:28] That is a huge concern. But look this is the concern of many many members of Congress. The Constitution says Congress comes together and decides how to appropriate money. And in this case the president actually signed to the bills in which we appropriated money all around the country for critical defense projects. And now the president because he couldn't keep a campaign slogan a campaign promise is talking about taking money away from critical projects that earlier he agreed were really important otherwise he wouldn't have signed our appropriations bill. Knoy: [00:33:01] Well, Governor Sununu has said that 'hey if Democrats had worked with the president on border security instead of fighting with him shipyard's funding wouldn't even be in question.' So I wonder how you feel about that Senator Hassan? Senator Hassan: [00:33:12] That's a pretty ridiculous statement. And I am disappointed that Governor Sununu has not joined me and the rest of the delegation in calling on the administration to keep the funding for the Portsmouth Naval Shipyard. We appropriate the money we secured the funding we worked in a bipartisan way on a spending agreement that the president told us through his officials at the White House he supported. And then at the end of the day when he got political pressure from TV commentators that he wasn't doing enough to build you know to keep this one campaign promise, he shut down the government over it. And I wish the governor frankly was standing up to the president on this and working with him because we did have an agreement about investing more money on border security with the president and at the last minute he changed his mind. Knoy: [00:34:08] What are the chances realistically Senator Hassan that this is going to happen? That those pots of money that were already assigned, as you said, for defense projects all over the country, not just New Hampshire, what are the chances really that this is going to happen? Because Senator Shaheen asked a top Navy official about this and he said you know this list was just based on a certain set of criteria. This is going to be a whole other process to determine what projects actually might see funds diverted. So the Navy anyway seemed to say don't worry too much about this. Senator Hassan: [00:34:41] I hope very much that the Navy is correct here and I hope that this turns out to be just some hyperbole from the president. The thing is my job is to stand up for our state and our country and make sure we have the resources we need to keep us safe and to stand up for the incredible men and women of the Portsmouth Naval Shipyard who do their jobs often ahead of schedule and under budget, year in and year out to keep us safe. And the thing about this administration is that we have seen unpredictable, unprecedented behavior and actions so as much as the Navy is trying to reassure us, so far that doesn't mean the president won't differ with his own navy. Knoy: [00:35:29] I want to pivot to the issue of infrastructure and share an email from Andrew in Keene who says 'with the discussion of infrastructure being mentioned now and again, especially by the governor, nobody seems to mention the transportation systems in our state rather than just quote roads and bridges.' Andrew says 'the state receives just one million dollars to fund every single program system which is very hard for various regional coordinating councils to work with.' Andrew asks 'Would the senator be willing to try and get additional funds for supporting public transportation in New Hampshire?' Andrew, thank you so much for the question. And we spoke with the head of the Manchester Airport just last week and a lot of listeners called in and said they are very frustrated that you can't get to Manchester by public transit. I mean you can take two buses and switch and so on and so forth. Andrew, thank you. Senator Hassan: [00:36:17] Well, Andrew it's a great question and yes I would be willing and am very interested in helping us increase investments in public transportation. As I think most of your listeners know, while I was governor, I was a strong supporter of extending commuter rail up to Nashua and Manchester. And it would be great if we could link commuter rail with Manchester airport among other things that would allow Manchester airport as I understand it to qualify as an international airport. If we decided to try to grow it in that way, so there is a lot of work we could do here and it would be good for our quality of life good for our environment and good for our economy. Which is why I think you also see Chambers of Commerce in New Hampshire supporting things like an extension of commuter rail and so I'll continue to work with my colleagues. You know one of the things that we are hoping we can find bipartisan support on moving forward in this Congress and beyond is around infrastructure. Knoy: [00:37:18] Beyond roads and bridges? Beyond the traditional version of infrastructure? Senator Hassan: [00:37:18] Beyond roads and bridges, and certainly look we need roads and bridges, we need broadband infrastructure, especially in rural places in New Hampshire and elsewhere in this country. And we need public transport. Knoy: [00:37:30] Isn't part of the problem, and I'm asking you this now with your background as a governor, it's a part of the problem in terms of public transportation that New Hampshire's constitution says you can't use state gas taxes for anything but roads and bridges? Senator Hassan: [00:37:44] We have a constitutional provision that the Supreme Court of New Hampshire has interpreted in that way. So we have a limited what we call the highway fund and it's written that way. So one of the things we have to do is find other resources. But that's one of the places where I think we could find the resources perhaps in partnership with Massachusetts and partnership with the federal government and partnership with some of New Hampshire's own funding to work on this issue. Knoy: [00:39:42] This hour we're sitting down with New Hampshire U.S. Senator Maggie Hassan, a Democrat and former governor of New Hampshire senator. Hassan sits on the Homeland Security and Governmental Affairs Committee. Senator Hassan, right back to our listeners. Peter is calling from Derry. Hi Peter, you're on the air welcome. Caller: Peter: [00:40:12] Good morning. I wonder do we allow Donald Trump to use the border as a squirrel type diversionary issue? Every time something really important like climate change, like health care, like education, like opportunity, every time it comes up he runs back to the border issue and everybody runs over and starts talking. How much of your show has been spent talking about the border issue and how much of your show so far has been spent talking about even more important issues? Knoy: [00:40:50] Thank you so much for the call Peter. Go ahead Senator Hassan. Senator Hassan: [00:40:53] Well, look thank you for the question Peter. And Let me just start by saying that you know when I think about the overall task at hand, I focus on how we can expand middle class opportunity for our working families for our small businesses. Certainly fighting the opioid epidemic is a priority for all the reasons we've talked about. Lowering healthcare costs, especially the high cost of prescription drugs is critical but we also can never forget that in order to do those things domestically, we have to keep our country safe secure and free. The first job of any government is safety. And so while I am concerned that the president keeps talking about a campaign promise he made around the border wall. I do think it is important that we work together across party lines to make sure that we are securing our borders appropriately in a way that's consistent with our values. Right now, we are seeing a kind of spike that's pretty significant in migrant flow to the border and that is stressing our resources and that is something we need to attend to. But that being said I take your point that we have dealt with this kind of migrant flow you know in the past we have seen spikes in in terms of flow before and we should be able as Americans to address that while also focusing on the need to combat climate change which is the existential threat we face along with looking at the other security issues. We face aggression from China, North Korea, Russia and Iran, terrorism both at home and abroad. Those are things we have to be able to focus on to. And I think it's really important that we continue to reach across party lines to do that and not let the latest tweet distract us. Knoy: [00:42:59] Well let's talk about health care since you mentioned it and Peter did as well and thank you again, Peter. The percentage of uninsured Americans is going up according to several reports. How much is that a reflection Senator Hassan on the Affordable Care Act? Senator Hassan: [00:43:14] We know that health care costs are too high. And one of the real drivers of that right now and has been for a while is the high cost of prescription drugs. What has been really important about the Affordable Care Act of which we need to continue to work to improve is that it has provided coverage for millions and millions of Americans who didn't have it before. And here in New Hampshire, for instance, the Affordable Care Act allowed us to expand Medicaid which people on the frontlines continue to tell us is the single most important thing we did in terms of getting resources to the frontlines so that people could get the treatment they needed to deal with their substance use disorder and get into recovery. There is a lot more work to do to improve and stabilize the Affordable Care Act. One of the things we saw is that in some areas of the country, insurers began to pull out of some of the markets and one of my concerns right now is that the administration continues to take actions that undermine the Affordable Care Act, destabilize it, make its future less predictable. Which means that insurance carriers who have to kind of hedge their bets, either pull out of these markets or increase their prices, partly because some of the things the government did to help stabilize things have been undermined or sabotaged by this administration. Now we have an administration that has gone has joined a lawsuit to repeal the entire Affordable Care Act which means that people with preexisting conditions would no longer be guaranteed coverage which means that we would continue to see more expensive and more fragmented health care in this country. And it would end Medicaid expansion at a time, by the way , that states that are conservative like Utah and Nebraska have by referendum authorized Medicaid expansion. So there are things we need to do to improve and lower the cost of health care especially around prescription drugs. But right now we are having to try to ward off this administration's attempt to undermine it and that is one of the things that is making it hard to address the overall cost issue. Knoy: [00:45:43] Well I have read that Republicans in the Senate, and the House, and I wonder what you think Senator Hassan, since you're in the Senate, have zero appetite for tackling the Affordable Care Act at this point. They are kind of letting the White House stand alone on this thing. Senator Hassan: [00:45:57] Yeah, they are letting--, some of the Republicans are saying that they don't want to deal with it. But let's be clear, their president and this administration has gone to court to say that the Affordable Care Act should be repealed and they should be standing up to him and saying let's work on it. And let me give you an example of some of the bipartisan work we are doing with care on health care. There is this issue of surprise medical bills. I know you've heard about it here in New Hampshire New Hampshire state legislature has has addressed it. But there's a whole group of health care plans that state law doesn't cover surprise medical bills or those bills that people get when they've gone to an in network facility or to it in network provider let's say in an emergency room and after they leave they get a bill from somebody who worked for that hospital who was that was just there for the day or never signed up with that insurance company to be a network. And these bills can be really massive, right? And so I think the patient needs to be taken out of this. This is a debate a dispute between an insurance company and a healthcare provider. Let them solve it. So I put in a bill at the end of this year to do just that. Senator Cassidy, a Republican from Louisiana, put in a bill, along with some others, and we are now working together, we just had an information session for other senators on it this week. I am hopeful that that's something we can address in a bipartisan way through our help committee. That's the type of progress we should be making. Senator Hassan: [00:47:31] Well and NHPR's Casey McDermott did a ton of reporting on that. We follow up with the show. So folks want to learn more, definitely go to the archives because it was a big, big issue. But speaking of the Affordable Care Act, and what some people say is the Unaffordable Care Act because prices have not gone down as much as expected, the number of uninsured Americans is going up. Although you cited the reasons why you think that's happening Senator Hassan. Some of your fellow Democrats running for president are saying look given all this that I just mentioned Affordable Care Act doesn't go far enough. Prices are still too high. People are still dropping out of coverage. Let's just go from Medicare for all where the government is the single payer. We hear this on the presidential campaign trail. I wonder what you think Senator Hassan. Senator Hassan: [00:48:11] I think what's really important is that we work to make sure that as we move forward here we are committed to the concept that health care is a right. Every American should be able to get health care coverage. We have to understand that no matter what system we have in place, there are things we need to do in this country to lower the overall cost of health care--and prescription drugs is a big piece of that. I've supported legislation that would lower prescription drug prices by letting our Medicare program negotiate for prescription drug prices, would let the safe importation of drugs from Canada into our country, and also to close some of the loopholes that allow pharmaceutical companies to keep their patents longer than they're supposed to and keep certain brand name drugs very expensive. So there are things we can do to lower health care costs. I am concerned when I hear about some of the proposals right now about the impact that those proposals would have. As you transition people from one system to the next, it can be very disruptive to change healthcare systems, especially if you're somebody with complex medical needs. I'm also concerned about the upfront costs of some of these proposals. So I as a member of the Health Education Labor and Pensions or HELP Committee will certainly consider any proposal that comes forward. But in the meantime, I think what's important is that we work across party lines like on surprised medical bills. We work to preserve the Affordable Care Act and really fight this administration's attempts to undermine and sabotage that act and that moving forward how we continue to work to drive down the cost of health care particularly right now. Pharmaceuticals the cost of prescription drugs is a major driver in health care. Knoy: [00:50:15] And we did get an email about the cost of prescription drugs. So it sounds like Senator Hassan when it comes to a single payer program, like some of these candidates are proposing, you've got some real concerns, you're not ready to jump in with both feet on that? Senator Hassan: [00:50:29] When you are talking about people's health care you have to understand how things are actually going to work when a system is deployed and what the impact on the people who need health care is going to be. We all at some point in our lifetime need health care. Some of us are luckier than others right. We go through life without a whole lot of health care issues. Others of us have complex medical needs or developed them or get in a car accident and all of a sudden need a level of care we never even imagined. I want to make sure that that care system is as strong as possible. And I want to make sure that every American get the right health care at the right time at an affordable cost and it has to be quality health care and that means I will consider any proposal really carefully. But the it's really important to understand how this will play out on the ground because people's lives are at stake. Knoy: [00:51:24] I want to ask you very briefly Senator Hassan about the Mueller report, the attorney general's summary of it. Now the attorney general says he'll release a redacted version in a few weeks. What will you be looking for in that redacted version? Senator Hassan: [00:51:36] Well, first of all I think the entire report should be made public. Obviously if there are classified items in there, they have to be dealt with as such. But you know we have congressional leaders who can sit with the administration and are allowed under law to get highly classified information and they should be able to see the full report. There are also other legal requirements that say that grand jury information is usually kept secret. But there are steps that can be taken to make that public too. I want to understand what happened here. This is about Russia attacking our democracy. The most fundamental part of our democracy which is our election system. And so I want to understand what happened. I want to understand who was engaged in what, I want us to be able to counter Russia and any other country that thinks that they can interfere with our elections. And that's why it's critical that we see this entire report. I also have to say that even before he issued this report, the Special Council conducted an investigation that resulted in 37 different indictments, three companies, 34 individuals-- six of whom were advisers to the now President of the United States. Knoy: [00:53:01] So you're not convinced by the AG's summary that the president had no fingers in the pie? Senator Hassan: [00:53:05] That isn't what I understand what the A.G. said about the Mueller report. I think the A.G. said that Mr. Mueller said the president was not exonerated and that he couldn't prove a conspiracy and I certainly hope the president wasn't conspiring. But I still am very concerned that six advisers to the President of the United States were indicted. We have had multiple guilty pleas. We have had one person found guilty by a jury, we have had five people sentenced here. This is serious stuff and I want to understand too, why it is that the president of the United States takes the word of Vladimir Putin over our own intelligence officials. Knoy: [00:53:47] In terms of Russian interference in the elections? Senator Hassan: [00:53:50] He stood in Helsinki with Vladimir Putin and told the world that he took Putin's word over our intelligence professionals about Russian interference. He's also by the way said he'd take Kim Jong-un's word over that of our intelligence professionals too. I want to understand why this president is Willing to prefer Russian oligarchs over American intelligence officials. And that concerns me greatly. So we just need to see the report. In the meantime though, we also need to keep doing the work that our constituents rightly call on us to do which is to reach across the aisle and find ways to help small businesses and working families to lower the cost of health care, to keep our country safe, secure and free. And that's also really important. People who are going to read the report and make their own conclusions from it. Knoy: [00:54:50] That's the question I wanted to ask you Senator Hassan. As you know Republicans and President Trump are promoting this report as a huge victory, validating their claim that this has been a witch hunt all along. Now we just heard you disagree with that, but I do wonder how much will further investigations, you know special committees of Congress and so forth, how much does more and more attention to this reinforce that Republican narrative, that this is just politics and Democrats uninterested in the country's buqsiness, they're just focused on this issue? Senator Hassan: [00:55:19] Well, first of all I think that what we now know from the attorney general is that he wrote, what was it, a three page letter, a four page letter about a 400 page report. So there's more in the report that we need to see in order to understand what to make of it. I also frankly think the fact that Mr. Mueller may not have found reasons to charge or indict the president the United States, doesn't mean we should be satisfied with the president of the United States behavior. I don't think it's good for the president of the United States to fail to stand up to Russia and take action when it is been conclusively proved that they interfered with our elections. I want to understand what happened here because I don't want any foreign power to ever again interfere with the foundation of our democracy which is fair and free elections. Americans need to have confidence in our election system so that we can come together and take on these difficult challenges we have, we are seeing an economy in transition and it is transitioning faster than anything we've ever seen before. We need to come together and work on workforce training, a whole slew of other issues: climate change, health care, we've talked about them today. And that starts with having the kind of free and fair elections that give us all confidence in our system. New Hampshire's U.S. Senators want toxic PFAS chemicals to be officially designated as hazardous substances at Superfund sites. Senators Jeanne Shaheen and Maggie Hassan are backing a bill in Congress that says sites with PFAS contamination should qualify for federally managed Superfund cleanup. New Hampshire Senator Maggie Hassan was among the lawmakers asking questions of the nation's biggest drug companies in Washington today. While much of the hearing before the Senate Finance Committee focused on the high price of prescription drugs in the U.S., Hassan focused her questions on the sales tactics the companies used when promoting opioids to doctors.